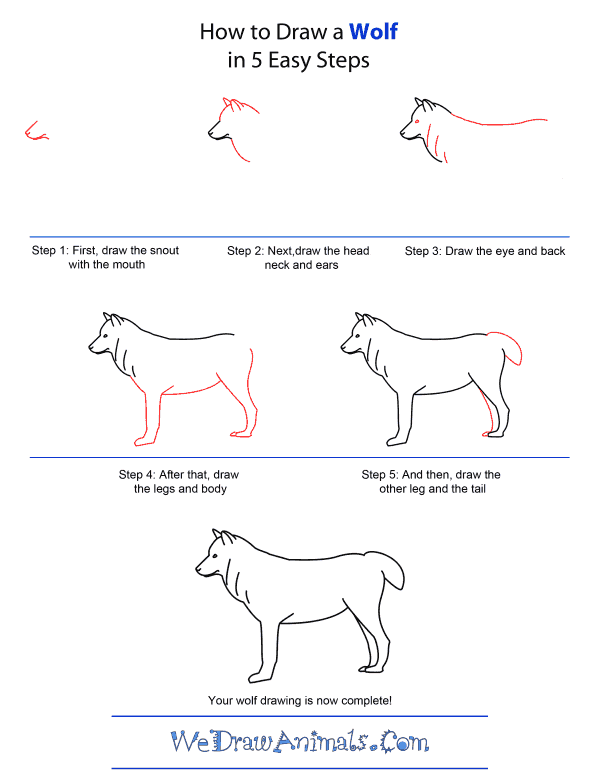 In this quick tutorial you'll learn how to draw a Wolf in 5 easy steps - great for kids and novice artists. 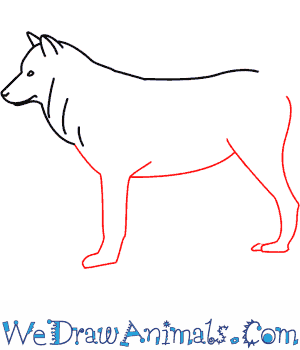 At the bottom you can read some interesting facts about the Wolf. 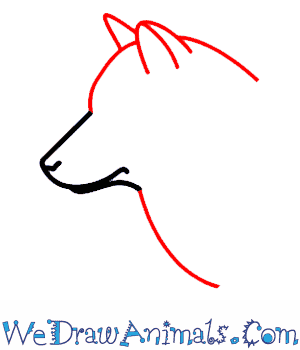 Step 1: Start by drawing the snout and the mouth. The mouth is a line drawn under the snout. The mouth is much thinner than the snout. Step 2: Next draw the head and neck. The head starts at the end of the snout and curves back. Add the ears at the top of the head. They point forward. 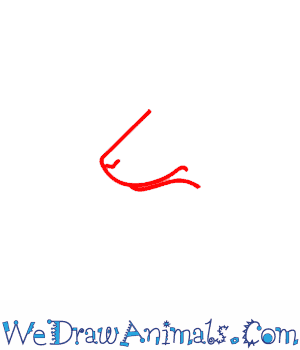 The neck curves slightly in as you draw it back. Step 3: Draw a long line for the back. The back curves down slightly and then curves back up at the rump. Add a tiny eye behind the snout. Draw in three lines across the neck. 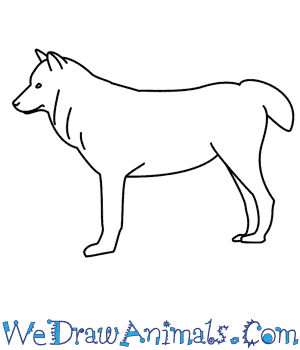 This is the fur pattern. Step 4: Continue the neck line to make the front leg. The front leg is the same width all the way to the paw on the bottom. Draw a curved line from the front leg to make the belly. Where that line ends add the front of the back leg. It is wider at the top than the bottom. 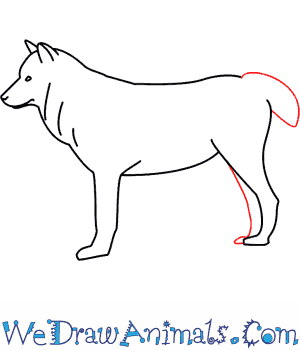 The back of the back leg will curve up into the rump. Leave a space between this line and the back line. 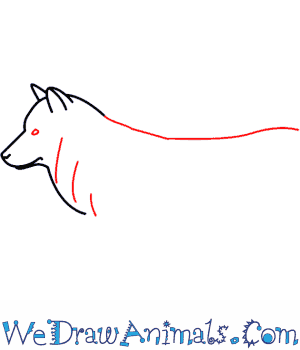 Step 5: In the space you left between the back leg line and the back line add the short bushy tail. Finally add the front of the other back leg and the front part of the back foot. Wolves hunt other animals for food. Their diet consists of moose, deer, and bison, among other animals. They always hunt in packs, never by themselves. Packs can be as small as two wolves or as large as 30, but they are usually made up of 6 to 8 wolves. On average, wolves live until they are 6 or 8 years old. They sometimes live until they are 13 years old. Wolves can sense other animals up to a mile away. Wolves have webbed toes that help them swim up to 8 miles at a time. Wolves can run as fast as 40 miles per hour, only for short distances. Howling is the way wolves communicate with each other. They howl to warn each other of predators, to find each other when they are alone, or to meet up when they are ready to go hunting. Wolves have a sense of family. Their packs are made of a mother, father, and their offspring. The mother and father mate for life and take care of their offspring the way human parents take care of their children. The gray wolf and the red wolf are the only species that live in North America.